I make dishes using drumsticks (Mashingasaang in Konkani, Muringakkai in Tamil and Nuggekai in Kannada) quite often. While choosing drumsticks, make sure they are a little flexible but don't bend too much. They should not be too hard either. You may be aware that the leaves of the drumstick are also used in cooking. This article in NDTV speaks of the health benefits of drumsticks. 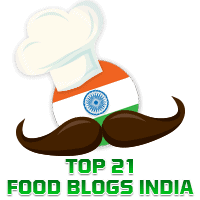 Elsewhere in this blog you will find recipes for Konkani dishes such as Batata Mashingasaang Upkari, Potato and Drumstick Upkari, and Magge & Mashingasaang Koddel, and for a Maharashtrian dish called Shevgyachya Shenganche Pithla. Today's recipe is commonly made in South India. Drumsticks and tomatoes make a tasty combination. This dish goes great with curd rice as it is a little spicy. 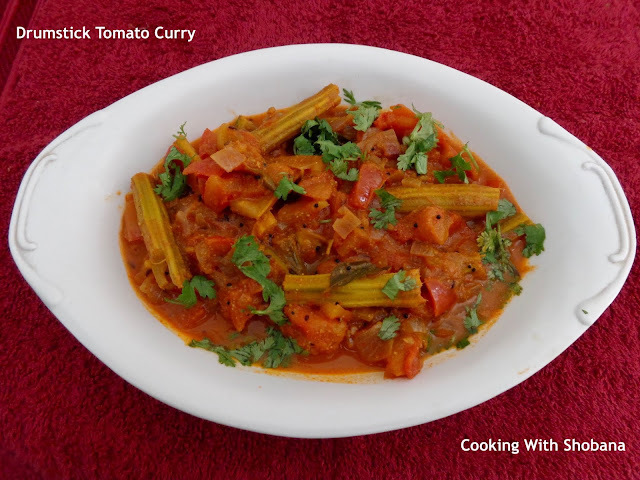 I have adapted this from Drumstick Tomato Curry by Vah Chef. Wash the drumsticks and lightly scrape them. Cut them into pieces of 1 to 1 and 1/2 inches in length. Chop the onion and tomato and slit the green chillies. In a thick bottomed kadhai, heat oil and when it gets hot on medium heat add the mustard seeds, and when they splutter add the cumin seeds. When the cumin seeds sizzle, add the slit green chillies, chopped onion, curry leaves, and salt. Saute till the onion gets slightly brown in colour. This should not get too browned. Add turmeric powder, ginger garlic paste, drumstick pieces and mix well.